ARC - Art Renewal Center "LIVING MASTER"
Vala is an artist who passionately and relentlessly seeks to create artworks that show her dedication to excellence. Her classical training in Europe is reflected in her art. Her figurative bronze sculptures and oil paintings are noted for their depth of expression and emotion. The high quality of her art has earned her great respect among art appreciators. she creates unique jewelry featuring her figurative sculpture pendants cast in silver and 24 K gold. 2001 Vala rekindled her interest in sculpting with clay after solely painting with oil for seven years. Her inspiration derives from her observation of life. Even the most mundane circumstance we find ourselves in daily will spark an idea. The Flemish artist Vermeer would paint the simple act of pouring milk, elevating it to a moment worth remembering for eternity, in a similar way Vala will look at a moment usually passed by as moment worth noticing. 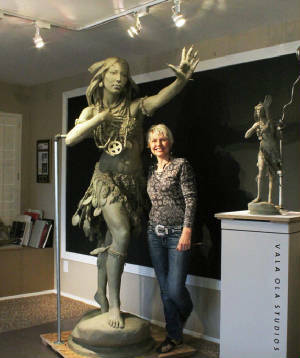 She sculpts and paints in her studio in Cave Creek AZ, northside of Scottsdale. 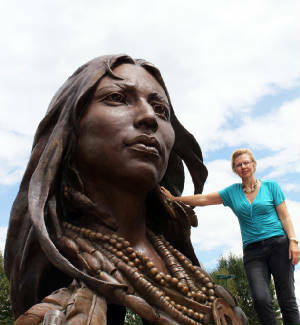 All her sculptures are cast in bronze. Vala was born and raised in Iceland. She has lived in the US since 1994. 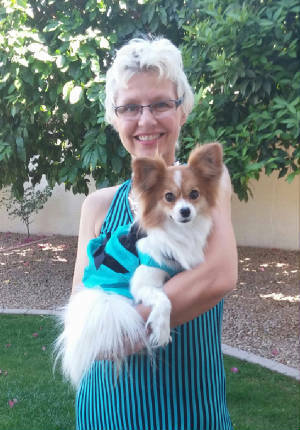 After 8 years in Santa Fe, NM, she relocated to Arizona. Vala Ola's artistic talent was apparent at age 4, and from the age of thirteen she attended classes drawing models from life. 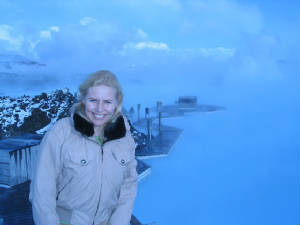 Graduating from the College of Hamrahlid, she furthered her studies at the Icelandic College of the Arts, and later graduated from The Arts Institute in Bournemouth, England. She won the Icelandic Design Excellence Award for the first time at the age of twenty-six. During her studies in England, she placed two entries among the finalists at the Smithsonian Young Illustrator's Competition. Returning to Iceland, she went on as her country's sole representative at the Nordic Graphic Design & Illustration Awards. Moving to the United States in 1994, she changed her focus to portraiture in oil, and found herself booked solid for the next 7 years. During those years up until 2001 she painted alongside William Alan Shirley. Their portraits were created for families and dignitaries alike. Immaculate likeness of her subjects and reverence for the technique of the old masters earned her great recognition in her field. She won the Best Figurative Award 2006 for her painting at the International Guild of Realism Annual Show in Santa Fe 2006. Vala's work has been exhibited in Reykjavik, London, New York, Los Angeles, Santa Fe, Scottsdale, Palm Desert, Santa Barbara, Carmel, Dallas, Aspen, Beaver Creek, Park City, Loveland, Nantucket. 2015 Art Renewal Center, 2014/2015 finalist sculpture catagory "Lost Tribes" and "Ulele"
2012 International Traveling Jewelry Show - Florida, Panama, Peru. Figurative Sculpture Pendants. 2012 John DiTomasi Gallery, Carefree, AZ. 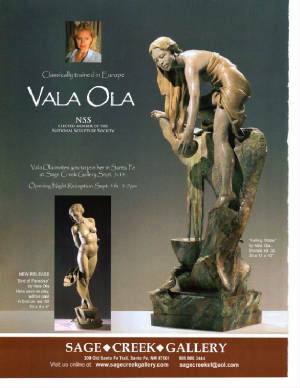 Vala Ola Jewelry and sculpture show. 2012 ASTA - American Society of Traditional Artists - 1s Annual Show, Scottsdale, AZ. 2012 Tempe Art Center, museum show "Family Matters"
2012 Knox Gallery, Beavercreek, CO. Vala Ola sculptures. 2012 Sculpture Invitational, Loveland, Co. August. 2011 Knox Gallery, Beaver Creek, Co. Representation year round. 2011 Jones & Terwilliger Galleries, Carmel, Ca.Representation year round. 2009 International Guild of Realism, Annual Show. Artist's Choice Award. Oil Painting. 2010 Unveiling of bronze sculpture of Christ in church, Lincoln, NE. TV coverage. 2010 Cavalier Galleries, Nantucket, MA. Representation year round. 2010 Sage Creek Gallery, Santa Fe, NM. Opening May. Vala will be sculpting in the gallery for 3 weekends in August. 2010 J. Willott Gallery, Palm Desert, CA. Representation year round. 2010 Celebration of Fine Art, Scottsdale, AZ. Jan-March. 2009 "National Sculpture Society 76th Annual Show", NYC. February. 2009 International Guild of Realism, Annual Show. Oil Painting. 2009 Cavalier Galleries, Nantucket, MA. Representation year round. 2009 Sage Creek Gallery, Santa Fe, NM. Opening May and August. 2009 J. Willott Gallery, Palm Desert, CA. Opening February. Representation year round. 2009 Celebration of Fine Art, Scottsdale, AZ. Jan-March. 2008 Allied Artist's of America, NY. Annual Show NY. 2008 Peppertree Art Show, Santa Ynez Valley, CA. 2008 Sage Creek Gallery, Santa Fe, NM. Openings Sept. and Dec.
2008 "National Sculpture Society 75th Annual Show", NYC. 2008 "International Guild of Realism Annual Show", Scottsdale, AZ. 2008 Wichita Art Museum, "The New Reality" IGOR Museum Tour, Kansas. 2008 The Springfield Museums, "The New Reality" IGOR, Massachusetts. 2008 Museum of Texas Tech University, "The New Reality" IGOR, TX. 2008 Leigh Yawkey Woodson Art Museum, "The New Reality" IGOR, Wisconsin. 2008 Jones & Terwilliger Gallery, Carmel, CA. Representation year round. 2007 Art Renewal Center Finalist Sculpture Category (with 2 entries). 2007 "International Guild of Realism Annual Show", Cape Cod, MA. 2007 Sage Creek Gallery, Santa Fe, NM. Openings June and Dec.
2007 J. Willot Gallery, Palm Desert, CA. 2007 “Celebration of Fine Art”, Scottsdale, AZ. 2007 E. S. Lawrence Gallery, Aspen, CO.
2007 Sanders Gallery, Tucson, AZ. 2006 "Raymond H. Brumer Award, Allied Artists of America 93rd Annual Show, NYC. 2006 “Best and the Brightest”, 2nd place professional award, Scottsdale Artist’s School. 2006 “Sculpture in the Park”, Loveland, CO.
2006 “National Sculpture Society 73rd Annual Show”, NYC. 2006 "International Guild of Realism Annual Show", Winner of the Best Figurative Award. Oil Painting. Manitou Galleries, Santa Fe, NM. 2006 “Peppertree Art Show”, Santa Ynez, CA. 2006 "Beavercreek Arts Festival", Beavercreek, CO.
2006 "Peppertree Art Show", Santa Ynes, CA. 2006 "Phippen Arts Festival", Prescott, AZ. 2006 “Celebration of Fine Art”, Scottsdale, AZ. 2005 Pioneer Memorial, one of three finalist (pending), Peoria, AZ. 2005 Public Art Sculpture, finalist, Longmont, CO.
2005 Phoenix Art Museum, live art auction, fetched highest bid in Breast of Phoenix. 2005 University of Dubuque, Iowa - Dr. Charles Myers— commission bronze statue. 2005 Monument commissioned, “Victory” 7 feet. 2005 “Sculpture in the Park”, Loveland, CO .
2005 “Riverwalk Fine Art & Sculpture Fest.”, Edwards, Vail Valley, CO.
2005 “Avon Fine Art & Wine Festival”, Avon, CO.
2005 “Peppertree Art Show”, Santa Ynez, CA. 2005 “Phippen Arts Festival”, Prescott, AZ. 2005 Pan American Art Gallery, Dallas, TX. International Guild of Realism, group show. 2005 “Celebration of Fine Art”, Scottsdale, AZ. 2005 Bronze commission, 3 life-size sculptures. 2004 National Guild of Realism, charter member. 2004 “Hidden in the Hills”, Cave Creek, AZ. 2004 “Phippen Arts Festival”, Prescott, AZ. 2004 Bronze commission, 3 life-size sculptures. 2004 McDowell Mountain Ranch Artist's League show, Scottsdale, AZ. 2004 Bronze commission, six life-size sculptures. 2003 “Art in the Home”, hosting TV series on art. 2003 National Sculpture Society, NY, membership. 2003 Sonoran Arts League Membership. 2003 Mr. & Mrs. Steven Rockefeller, NY, portrait commission. 2003 Spirit of the Senses, lecture and art viewing, Scottsdale, AZ. 2003 Three life-size bronzes commissioned by Mr. & Mrs. Cameron, OK.
2002 Scottsdale Artist Society membership. 2002 “Celebration of Fine Art, art show”, Scottsdale, AZ. 1995 thru 2002 Waterford Marriott Hotel, Oklahoma City. Yearly invitational art show. Commissioned portraits. 2001 Touring Iceland and Denmark. 2000 The Artist’s Magazine, finalist winner in portrait category. 2000 The American Society of Portrait Artists, membership. 1999 Ventana Fine Art, Santa Fe, NM, group exhibition. 1998 National Museum of Catholic Art & History, Rockefeller Center, NY. 1997 CCA, The Center for Contemporary Arts, Santa Fe, NM, group exhibition. 1996 The Santa Fe Society of Artists, Santa Fe, NM. Art shows summer and fall. 1996 Allied Artist of America, membership. 1995 Cynthia Woody Gallery, Scottsdale, AZ. 1995 Carrot’s Gallery, Santa Fe, NM, group exhibition. 1995 Geoffrey’s Restaurant, Malibu, CA. Art for Heart’s Sake, group exhibition. 1994 City Hall, Reykjavik, Iceland, group exhibition. 1994 Nomination to represent Iceland for the Nordic Graphic Design and Illustration Awards, Denmark. 1994 House of Argentina, Reykjavik, Iceland, 10 commissioned paintings. 1992 St. Martin’s in the Field Gallery, Trafalgar Square, London, two woman show. 1991 The Mall Gallery, “BPCA&D Exhibition”. 1990 Smith’s Gallery, London, UK. “Reader’s Digest Young Illustrators’ Exhb. 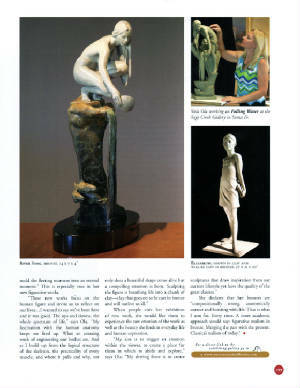 Article on Vala Ola published in the American Art Collector magazine. 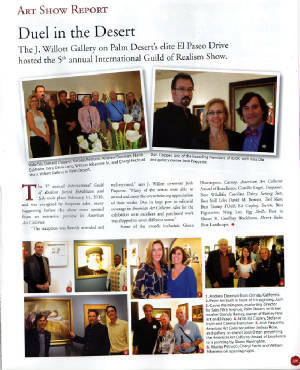 Article on the International Guild of Realism show 5th Annual show in J. Willott Gallery, Palm Desert, Ca. "The bronze gives me an opportunity to mold the sense of life into an everlasting form. From the force of a muscle in motion to a tender human emotion expressed. That along with the abstract quality of composition is what inspires me. When painting I get to play with colors as well as composition"
Vala Ola at the Blue Lagoon in her native country of Iceland. "All we have in life at any given time is the very moment we are living and that moment is of importance. "Vala says. "I would like to inspire myself and others to have awareness and appreciation for our life." 1994 - 2001 Vala Ola works side by side with mentor and portrait artist William Alan Shirley. She quickly masters the art of portraiture and they start co-signing their oil paintings, producing over 100 portraits in a classical realism style over a 7 year period. 1970 - 1978 From the age of 8 thru 18 Vala attended evening art classes twice a week at Reykjavik's Art School, Iceland (Myndlistarskolinn i Reykjavik) - Drawing the model from life at the early age of 13. Teacher Hringur Johannesson. 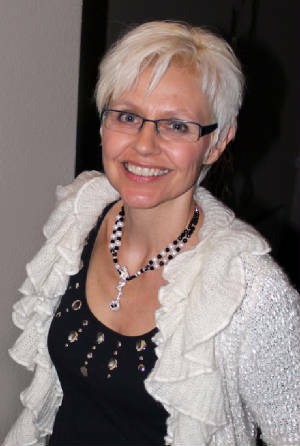 1962 Born in Reykjavik, Iceland. 2013 Art Renewal Center finalist sculpture catagory. Bronze sculpture "Bill Rowett". 2012 Art Renewal Center - Honorable Mention. Bronze sculpture "Falling in Love". 2011 International Guild of Realism, Annual Show. Finalist. Oil Painting "Eye of the Peacock". 2011 Art Renewal Center finalist sculpture catagory. Bronze sculpture "Awakening". 2011 Art Renewal Center finalist painting catagory. Oil painting "Girl with Pearl Earrings II"
2011 International Guild of Realism, Annual Show. Finalist. Oil Painting "Girl with Pearl Earrings III". 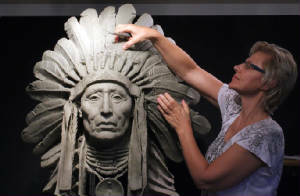 Vala Ola sculpting "The Chief"
The monument of "Ulele" ready to be molded and cast in bronze. The smaller maqeutte on the right.